Tabane translates to bundle (verb, as in to manage or control). Tabane kagari are back stitches taken around a bundle of threads in order to keep them positioned and neatly organized. They will often be found in designs using jyouge douji, where there are bundles of threads crossing the equator, as in the example to the right. Tabane kagari usually replace the keeper pins that were used while the design was being worked. The stitch itself is simple - a back stitch around the crossover or bundle center. The little things that go along with it are what require attention. The bundled threads must be smooth and groomed as much as possible, to be laying flat and even. The size of the tabane will adjust depending on the size of the bundle, and how far out from the center the tabane are worked. The tabane kagari is not just passed around the bundle of threads, it takes a stitch into the mari wrap as well to hold things in place on the mari. Another example would be the tack stitch used to hold matsuba kagari in place. This is a modified example of a thread bundle being created in the stitching process. It is being held in place with keeper pins. Anchor a working thread to the left of the crossover, just under the equator. It should be close to the keeper pin. Take a back stitch: carry the thread to the right back over the thread bundle to be anchored, and take stitch under the bundle, into the mari, coming up where the thread was originally anchored. Complete the stitch but use care with tension - it should be snug but not distorting the lay of the threads in the bundle. Repeat the above steps, but bring the needle up just north of the equator. Note that as this second stitch is a bit wider, allowing for the natural width of the thread bundle. This widening will happen as more stitches are added, working toward each pole. Complete the stitch on the north side of the equator. Better balance is achieved by working a few stitches on each side of the equator at a time rather than all of one side, and then the other. Complete 2 stitches on the north side of the equator and then resturn to the southern hemisphere. Repeat until the desired number of tabane kagari have been completed, remember to be careful with tension. The thread bundle should still lay smoothly running into and out of the tabane stitches. 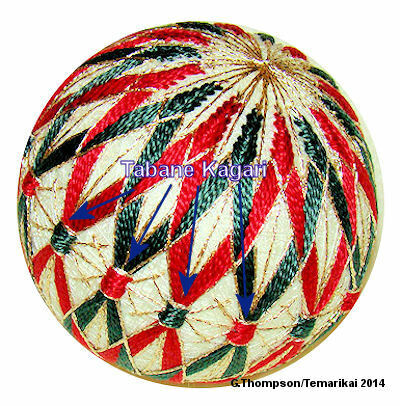 These 2 examples show tabane kagari at the equator of each temari. The photo on the right also includes small matsuba kagari. Last updated 1/2014 © 1998 - 2014 G. Thompson/PuffinStuff, Inc.